Home → Dear Nora → Dear Nora: How do I Sell Everything to Travel? Dear Nora: How do I Sell Everything to Travel? How do you sell everything to travel? There’s no one way to do it, and in fact, as you’ll read below in interviews with people who have done it, a multi-faceted approach is key. In this article you’ll find tips and tricks to help you sell everything to travel, along with experiential advice on how to do it. The first step to sell everything to travel is to sort it – since not all of your stuff will necessarily be saleable, and surely you’ll want to keep a few things (in fact, legally, you should keep a few things like the last seven years’ worth of tax returns). Most people sort their stuff into three categories: sell, store, and take with me. One of the resounding pieces of advice you’ll read below from people who have done this is to allow lots of time to sell your stuff. It generally takes longer than you might imagine, and if you want to fetch reasonable prices, you need time on your side. Personally, I took four months to sell everything to travel. It’s not as easy as you might think to get rid of everything. Myself and everybody interviewed below used multiple methods to sell their stuff. Also, by targeting what you sell, how you sell it, and to whom you sell it, you stand to not only increase the chances of making a sale, but also the money you can make. As your belongings are sold over time, you’re going to be living in an ever-dwindling home. Be prepared to live simply as various items of convenience (and even necessity) disappear. When a buyer came in for my couch with an immediate need and an offer I couldn’t refuse, I had to concede to sitting on boxes during my last few weeks in Canada. You may have paid a small fortune for certain belongings that are still like-new, but you’re not likely to get what you paid for them when you sell. Price your stuff reasonably to increase your chances of getting rid of everything. The sky is the limit! Here is a list of places and ways you can sell your belongings, most of which which I and many of those interviewed below have used. Remember: using a multi-faceted approach will result in your best success. Have a Party – Invite your friends over to raid your closet! Virtual Garage Sale – Create a website with pictures and prices of everything you’re selling. Refer it to friends and promote it on social media. You can also use it as a referral point for online listings (like Craigslist and eBay). Facebook – Not only is a status update about sale items effective, but Facebook also has dedicated buy/sell groups where you can create listings. Craigslist, Kijiji, Varage Sale – What I like about these platforms is that you can list your items for pick-up only, saving you the hassle of shipping, and increasing your chances of cross-selling other things you have for sale. 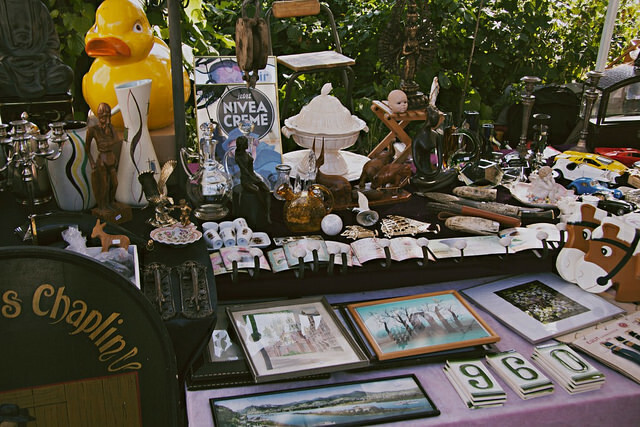 Cross-Sell – When somebody comes to pick up one thing from your place, tell them everything is for sale and have it priced so they can “window shop” some impulse items! eBay, Amazon– I didn’t use either of these (I couldn’t face the idea of shipping), but many people below used them with success, especially with certain items. Local Colleges – Students love a bargain, especially at the beginning of the school year when they’re moving in. Post flyers around school and create listings on online college forums. Living Estate Sale – Estate sale organizations will come into your home and catalog and sell everything for you (and take a commission for their services). This works best if you have lots of expensive or specialty items (like antiques) and are short on time. Specialty Forums – Use the classified sections of specialty forums to sell your related specialty gear. Raffle – Create “kits” or “baskets” of related items of a theme and raffle them off to friends, specialty groups (ie: the local cycling club), or donate to service clubs. Yard Sale Clearance – Having a yard sale is a great way to get rid of whatever doesn’t sell at the end, and if you see any “professional garage salers”, ask them to make you an offer for everything. Don’t try to reinvent the wheel; these people below have done it, they know what works best, and here they share their advice with you! Erin McNeaney and Simon Fairbairn of Never Ending Voyage are a digital nomad couple who sold everything they owned in 2010 to travel the world forever. They are also the creators of the iOS app Trail Wallet, which helps travellers stay on budget (and is one of my personal favourite apps). How did you sell everything? I spent most of my time selling things on Ebay—I found electronics, photography equipment, CDs (if new or unusual), art supplies, and anything signed, rare or limited edition sold well. I also set up a simple blog that listed our bulkier items like furniture and sent the link to friends and colleagues and encouraged them to forward it to their networks. This worked really well and became our most profitable selling tool. It was also much easier than Ebay and we didn’t lose out with listings fees. I definitely recommend starting with a blog, especially for furniture and high-value items like electronics. Anything you can’t sell through your networks, you can then put on Ebay. We also sold books on Amazon Marketplace and attended a car boot sale, but these weren’t very profitable. We have two small boxes of photo albums and old letters that we store at Simon’s mum’s house. His drum kit is also in their loft, but he hasn’t looked at it in six years, and we really should have sold it at the same time as everything else. The biggest challenge was getting started and overcoming the sentimental attachment to stuff. We found that once we began, it got easier as time went on and, by the end, we just wanted rid of it all. Start as early as you can because selling stuff is very time-consuming. It can be overwhelming at first, so begin by making an inventory—go around each room of your house and write down all of the items you could sell. Don’t forget to look inside your drawers and cupboards for things that you never use. You may want to create two lists – Sell Now for items you rarely use (if you haven’t used it in a year, it should definitely go), and Sell Later for things you use on a regular basis. Once you’ve sold everything on your first list, go around again and add more items – you can always find more to sell. You’ll find that things you didn’t think you could part with at first are easier to let go once you’ve had more experience selling things. 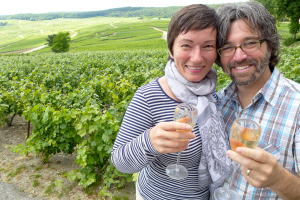 In 2012 Jen and Ted sold everything they owned (everything), and in 2013 they quit their jobs to pursue a life of long-term travel. 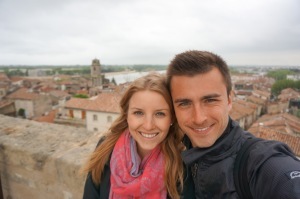 They quickly learned firsthand that travel didn’t have to be as expensive as most people think, and created their blog Thrifty Nomads to prove it. We sold our possessions by listing them on every major online platform. As Canadians, that included Kijiji, Craigslist, and VarageSale. The trick is to put effort into every sale – posting concise, accurate detail of an item’s condition, attractive adjectives (e.g. “this vibrant piece would warm up any room!”), and bright, clear photos. When communicating with potential buyers, it’s wise to be prompt with all inquiries so you can close the sale. We also found posting online “For Sale” albums on our Facebook to be effective too, as it meant friends and family could virtually browse our items any time, then request to buy them on our next visit. Finally, whenever we sold items, we would always invite buyers up to our apartment where we had meticulously “priced” every item in our home with sticky notes. We’d ask if they’d like to package any other items at a discount, which usually ensured a couple more items were purchased. Up-selling works! The commonest frustration is no-shows and flakey people. It is often better to sell to the first person available to pick up, as opposed to the first person to contact you. We’d send an apologetic message informing people that we needed to sell the items ASAP, so everything would go on a first come, first served basis (unless they were buying a stockpile of things). Too many times we were burned by holding items for people who never followed through. Give yourself LOTS of time and be patient. Sort and sell your items in sessions – you won’t get it all done in one go, but there’s a lot of potential money to be made if you can slowly work through it. The more time you give yourself, the less urgency there is to sell at any price. This means better return on your items and more money back in your pockets. 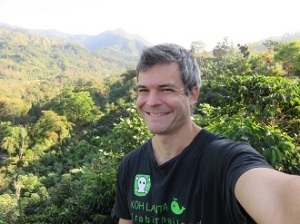 Ryan Biddulph is a blogger, author and world traveller who has been featured on Richard Branson’s Virgin Blog, Forbes and Neil Patel Dot Com. He can help you retire to a life of island hopping through smart blogging at Blogging From Paradise. I did a fair amount of selling offline. I sold my car to a garage and received the proceeds in cash. A simple online search alerted me to buyers in the area. I received a phone quote. Someone showed up with a flat bed. Appraised my car. We agreed on a price. Transaction made. Car gone. I sold goods like televisions and other entertainment media through garage sales. Slapping a price on goods in solid condition nets you a tidy little profit. If I wasn’t able to sell something I gave it away to either friends and family or to organizations like the Salvation Army. I wrote off all charitable contributions on taxes. Consider using sites like Craigslist as well as local forums and advertising sites to sell your stuff. The more options you give yourself, the better. If goods were in poor condition I threw them out. I enjoy releasing what’s old and worn out for the new and exciting. Almost like forming a vacuum for exciting, prospering travel experiences to move into your life. I kept my wallet, cards, backpack, suitcase, laptop and tablet for my travels. I also kept winter clothes for when I returned to New Jersey. I store said clothes at my mother-in-law’s house where we live during visits home. I also store paperwork at my parents’ house. Other than these few physical possessions I am as free as a bird. The less stuff a digital nomad owns, the better. No big challenges per se but I recall when my wife Kelli sold her car while we were travelling. The car needed to be moved because of construction. Instead of storing the car anywhere – it had no value to us since we’re virtually full-time travellers – she sold it, made a profit and let it go. It was an unexpected but invited development because it inspired us to release what we weren’t using to make room for what we could use. Dissolve emotional attachments to worn out stuff. Don’t sell stuff to make a profit. Sell stuff to release the useless and make room for the useful. Detaching from the profit outcome helps you to generate more sales and also helps you to prosper more freely during your travels. Will Hatton is a writer, photographer, adventurer, and vagabond. He is currently hitchhiking from England to Papau New Guinea, a journey which will take over two years. 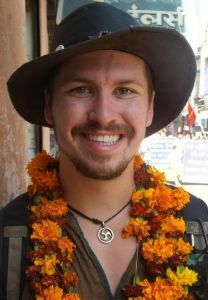 Will blogs at The Broke Backpacker about his adventures in some of the world’s least visited countries. I mostly sold my stuff on Ebay but I also spotted a good opportunity on Amazon. I trawled local car boot sales and charity shops, finding books that were in good condition and then quickly checking their retail price on Amazon using my phone – if I could make a single buck by buying the books and then reselling them, I would do it. I quickly kicked this up a notch and arranged to buy a pallet of ‘approximately 1000 used books’ from a warehouse for just one hundred bucks. I flipped them at car boot sales for around 50 cents to a dollar each and then did it again. All the while, I continued to sell everything I could get my hands on. Luckily, as a kid, I had been a bit of a collector and had a large collection of tin soldiers – I took these to antique shops and sold them at well under their value – I didn’t care, the aim of the game was to get on the road. Everything I kept came with me in my backpack. Actually, that’s not true – I kept my trusty teddy bear, and left him on the mantlepiece of my folks’ home. My room was bare by the time I left. Look for a gap in the market and try not to undersell your stuff. Know which platform is best for selling which items; for example, I found Amazon a much better place to flog books than Ebay. Another good tip is to be on the prowl for things to sell when you get back from your travels – for example, in India, I bought thirty leather satchels at around $12 each, I then sold them for between $40-70 each on Ebay and at a music festival when I got back home. Silk scarves, silver jewellery and hippy shirts are all cheap to buy and all sell well at festivals. 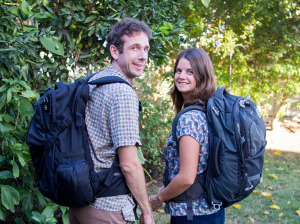 Warren and Betsy Talbot began selling everything they owned in 2008 and 25 months later, left to travel the world in 2010. They use their site An Uncluttered Life to teach busy people how to remove what’s not working in their lives so they can stop settling for living their “plan B”. Through their popular weekly podcast and their books and courses, they share the practical, road-tested strategies that cure the overwhelm of modern living. Craigslist – we used this to sell everything from our bedroom furniture to an old box of cords to all of our books (TIP: when selling books sell them as a lot and make it clear that whoever buys it will need to take them all. This allows you to get them out the house in one go and not having people pawing through taking only what they want and leaving you with more work to get rid of the rest). Indoor yard sale – invite your friends to your home to “shop” for whatever they would like. These are people who already know of your plans and would be interested in your stuff. Then you put tags on all the items. You can either put prices on items or have people make donations. Reverse Birthday Party – to celebrate Betsy’s 39th birthday (which was the last she had before we left) she invited her closest friends for an evening to go through her 39 “most cherished” possessions. They got together, enjoyed wine, and each person identified what they wanted. Anytime there was an item 2+ people wanted they had a “style off” and the attendees voted. She left a box out on the counter for donations but did not price any items. Garage sale – we took some items to garage sales of friends as our townhouse was not ideal. Then we helped the friends with the event and enjoyed a day selling our stuff. Consignment stores – we took a few pieces of art to a local dealer who sold them on consignment. Facebook – for some items we would post them directly to Facebook to get the word out to friends. We’d also encourage them to share with people they know who might need something we were selling. This is actually how we sold our car. Up-sell – when people came to our house to buy something (for example from Craigslist) we would bring them into our “staging area” and if they saw something they liked we’d sell it to them right then. Virtually everyone who came bought more than they expected. Betsy’s packrat tendencies were our biggest obstacle. She struggled to let go and held onto things longer than I would have liked. We dealt with it with the Reverse Birthday Party idea so she could let go of the most emotional items last and share the experience with her closest friends. The rest we slowly let go through the process starting with the least emotional items (the snow shovel went first) and moving down the list. Start earlier than you expect as this is a long process. It is far easier to get the prices you want from selling your stuff if you are not in a desperate situation. Also, always remind yourself why you are getting rid of your things. The logistics of decluttering for a big dream are far easier to manage than the emotions. This is why we dedicate half of our Declutter Clinic course to handling the emotions and mental aspects of the process. When you need to get rid of that chair that Uncle Gordon made or the sweater that your late Grandmother knitted it can be challenging. But remember why you are doing it and what you will gain in the process. Warren and Betsy have created an entire course about Decluttering, but if you’d like to get a jumpstart on the process you can sign up for a series of five emails to help you with the effort at Declutter Clinic. An indefinite life of travel might sound good now, but many travellers tire of the lifestyle after a while. How will you feel if (or when) you want to start a new home from scratch? Will you regret having let go of your prized possessions? Before you decide to sell everything to travel, consider your options; maybe you have a relative with lots of storage space who can keep some things for you, and/or you could lend large furniture items to friends currently in need. Alternately, you could rent a storage locker (although this can be costly). Just make sure before you pull the plug that you’re prepared for a variety of eventualities. Although it might be tempting to fund your travel adventures with the proceeds from selling everything, consider the possibility that you might – at some point later down the road – want to set up a home again. Personally, I invested the proceeds from selling everything to travel in a high-interest savings account so I would have the option of creating a new home at whatever time (or place) struck my fancy. This served me well, as I’m now creating a home for myself in Peru after 10 years of being on the road. (A great high-interest savings account for these purposes is Tangerine; use the “Orange Key” 15312741S1 to get $50 when you open an account! Click here to learn more about how I use my online savings account effectively while travelling). Don't subscribe All Replies to my comments Notify me of followup comments via e-mail. You can also <a href='https://www.creditwalk.ca/comment-subscriptions/?srp=4673&srk=2648578ecea05c83754707575dc5a494&sra=s&srsrc=f'>subscribe</a> without commenting.